Ruminations: Oh, No It Doesn't (or, Tennessee Passes a Bill that Does Nothing). Oh, No It Doesn't (or, Tennessee Passes a Bill that Does Nothing). You might guess that I have exactly ZERO trust in the ability of the Press to accurately report anything. I don't trust any reporter to accurately count his own toes. So I've taken up the habit of tracking down bills that are reported in the news and reading them myself. This is why that's necessary. The enacted legislation doesn't do ANY of that. While the text presented matches a draft of the bill, the enacted legislation doesn't do a single thing mentioned in this article. It's a bit bizarre, because the drafts that are posted even on Tennessee's General Assembly website are all of the un-amended bill, though the summary states something completely different. If you pull up the amendments you'll see why. It's the ultimate sort of bait-and-switch legislative tactic. Note that the amendment starts with, "by deleting all language after the enacting clause and substituting instead the following". They deleted the whole bill and passed something else. Legislatures do this a lot. But at least this one is in the same ballpark, right? 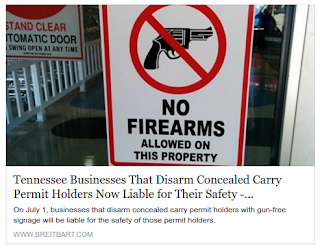 With indemnity, business owners don't have to feel pressured to ban firearms, right? Wrong. Despite its stated intent, this is unlikely to stop even a single lawsuit, due to the negligence clause. This loophole allows anyone who wishes to bring a lawsuit by simply including in his complaint the argument that failure to adopt a gun ban is negligent on the part of the property owner, and the proof is that someone was injured by a gun and they had the authority to prevent it. That must then be argued in court. The lawsuit proceeds. In other words, this bill does exactly nothing. There is nothing that actually prevents a lawsuit against a property owner who does not ban guns, and there is no requirement for the ensuring the safety of permit holders who are denied carry. If you're paying no attention it certainly looks like a gun-rights victory. It's nothing of the sort. Put away your trumpets, Second Amendment defenders.